Every once in a while I come across a new word that even Word’s spell-checker and Thesaurus doesn’t recognize. It’s as intriguing as stubbing a toe on a treasure buried in the sand. Today’s word is ‘liminal’. I found it in the context of an article on this time of year, late October, early November. 3: of, relating to, or being an intermediate state, phase, or condition: in-between, transitional <in the liminal state between life and death. I love that word. Sure, I’ve used its derivative, ‘subliminal’ before, but not ‘liminal’. I tried to think of examples where I could use it in my own writing. It came to me a week ago on October’s last weekend. A beautiful day lured us outside on our favorite autumn hobby of years long and not so long past. Donning dusty hiking boots, pocketing Swiss Army knives and Audubon’s Field Guide to North American Mushrooms, off we went in the pursuit of those tasty morsels. These gifts of the forest are not easy to come by, and only those with patience and stamina will be rewarded. Our destination was Cypress Mountain just west of Vancouver, an area we used to frequent with much success in the past. I can’t give you the exact location of where we find these mushrooms, because if I did, I – like any forager – would have to kill you. That’s serious business, you know. So back to liminal. Our trip turned out to be both threatening and alluring. We knew we had only limited time, because ‘the dark begins to press its case’ was how that article I read put it so poetically. But we had a few hours before that. Hours of clear blue sky we gleaned once in a while as the sun filtered through century old Douglas firs, hemlocks and cedars. 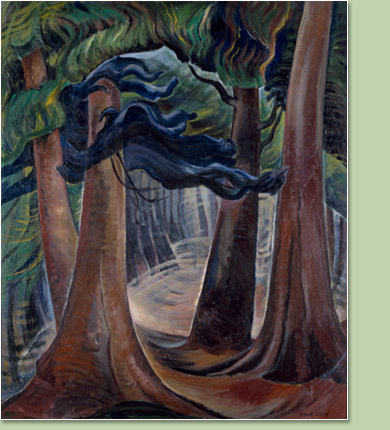 Emily Carr’s haunting forest paintings came to mind as we thrashed through the underbrush of lush ferns, prickly Oregon grape and salal. These plants, growing amid decaying fallen trees and thick mossy underground are the ideal conditions where mushrooms thrive. All mushrooms: edible, poisonous and deadly alike. Webster’s notation came to mind: ‘in the liminal state between life and death’. We keep climbing over fallen trees, inhaling the tangy scent of decay that naturally seems to invoke memories. Finally, we found what we came for: beautiful golden chanterelles, poking their heads through the moss. It’s hard to describe the joy of discovering, and then harvesting these fragrant mushrooms. Their stems often grow deep below the ground. 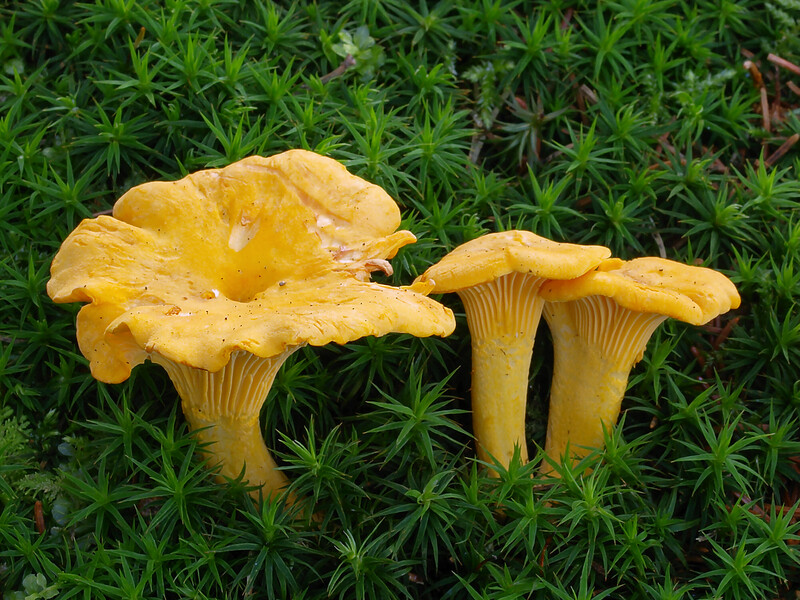 After a swift cut with the knife we look beneath in search of the trumpet-like shape and gills descending down the stem to make sure it really is a chanterelle, not a toxic lookalike fungus. I close my eyes and inhale deeply: the alluring scent of apricot, a surefire way of identifying the delicious fungus. Forests of the Pacific Northwest possess a unique and eerie beauty. We become aware of it as we go deeper, collecting more mushrooms. Quite possibly we are the first humans who have set foot on this particular spot. A moment made even more special when shared with the person closest to you. The silence so complete I can only describe it as deafening. The only sound is my breath and the odd twig crunching underfoot. Suddenly the silence breaks with the echoing sound of a flock of geese flying high overhead on their way south. It’s not a disturbing sound but in harmony with the silence of the forest. The light becomes flat with the sun dipping low at four o’clock. Time to leave with our loot. By the time we get back, our legs, especially the knees, demur in protest. But we hush them and by the time dinner is on the table, we’ve made peace. How can it be otherwise? The orecchiette pasta, ideal for holding the delicious sauce of sautéed chanterelles, garlic and a little cream is just the right tonic for tired limbs. I try to think of ways to include some of the sensory delights of the day into my writing. 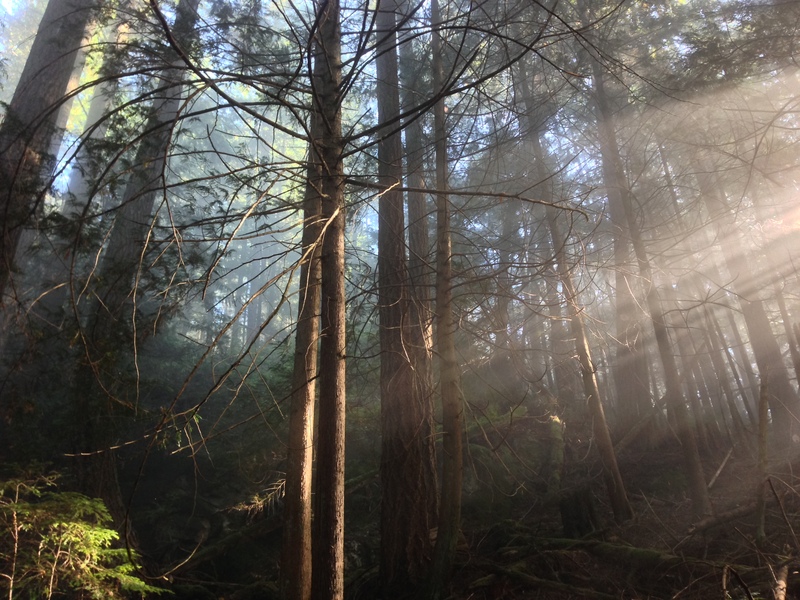 I will try to twist my plot to include a scene deep in an untouched Pacific Northwest forest. I want to create some liminal content. That aside, it’s time to cuddle up with a good book as winter sets in. And for us writers, time to plow ahead with our stories. We’ve run out of excuses of endless summer days that beckon us with a magnetic pull to stay outside. Time to hunker down, reach deep into our sensory treasure chest and weave them into our stories. This entry was posted in Emotion, Inspiration, Storytelling and tagged Autumn, chanterelles, Emily Carr, Mushroom foraging by Helga Bolleter. Bookmark the permalink. Loved your post Helga. I felt I was in the forest with you (although no clue where I was). I’m looking forward to all the wonderful sensory details in your stories. I could never trust myself to choose mushrooms that weren’t deadly, so I will leave this adventure to others. Fortunately, this means you and other gatherers will not feel the need to dispose of me! Liminal is a word I encountered early in my anthropology courses. It’s frequently used in the context of describing rituals such as those for coming-of-age and marriage. In such rituals, children, for example go through a liminal state in the rituals on their way to adulthood. Helga, you have perfectly captured the magic and mystery of our ‘wet coast’. I love it here when the northern sun shines and the waters glitter … but for me the natural ‘soul’ of our beautiful coast comes out in transitional shoulder seasons – spring and fall. That’s when the rains and mists give life to the land. I could almost smell the perfume of the forest floor when I read your foraging post. Beautifully described. Thanks, Silk. Yes, it’s the smell, or perfume of the ‘wet coast’ that so evokes images and awaken the senses. That is the beauty of this time of year, even though the rains will soon keep us indoors. Great post Helga. I knew the word liminal but I agree- Awesome word. Nice to see you experimenting with it. And even though I loath fungi of all kinds, I enjoyed your trek through the forest in search of them. There is something very mysterious and mystical about mushrooms. Thanks for your thoughts. I totally agree about fungi being mystical. They are the first form of life long before homo sapiens evolved. No wonder we are intrigued. And with a littlle TLC they even taste delicious.